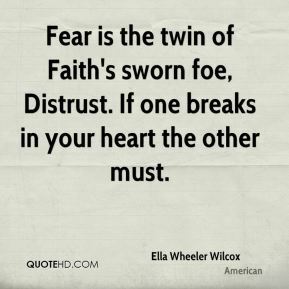 Fear is the twin of Faith's sworn foe, Distrust. 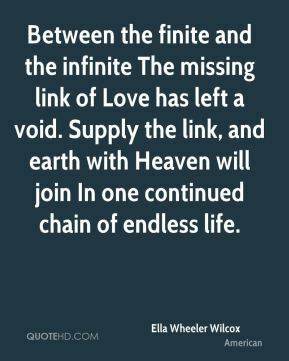 If one breaks in your heart the other must. 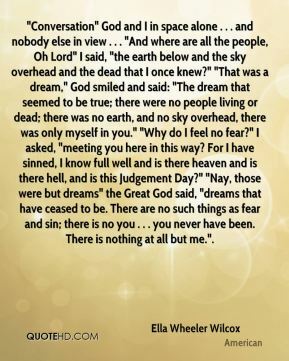 The world has a thousand creeds, and never a one have I; Not a church of my own, though a million spires are pointing the way on high. 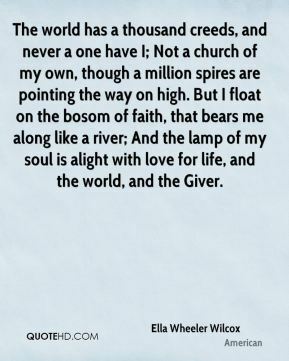 But I float on the bosom of faith, that bears me along like a river; And the lamp of my soul is alight with love for life, and the world, and the Giver. 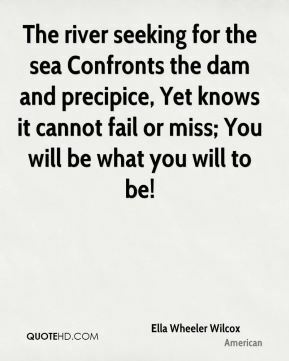 BE STILL: Be stiller yet; and listen. 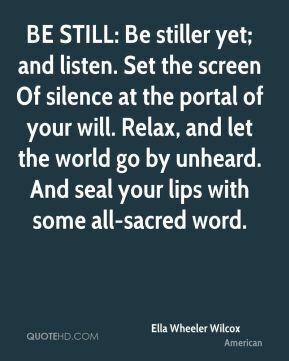 Set the screen Of silence at the portal of your will. 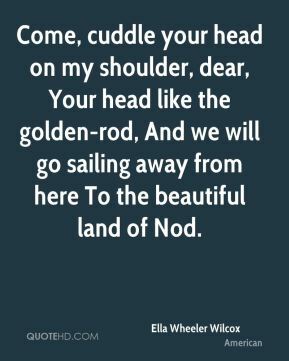 Relax, and let the world go by unheard. And seal your lips with some all-sacred word. 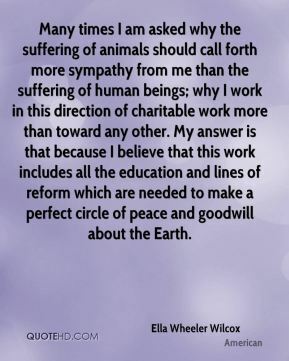 Many times I am asked why the suffering of animals should call forth more sympathy from me than the suffering of human beings; why I work in this direction of charitable work more than toward any other. 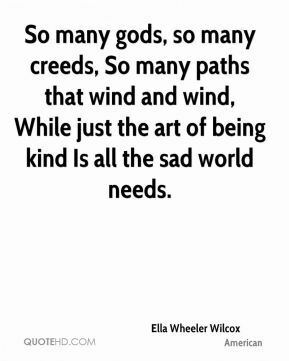 My answer is that because I believe that this work includes all the education and lines of reform which are needed to make a perfect circle of peace and goodwill about the Earth. 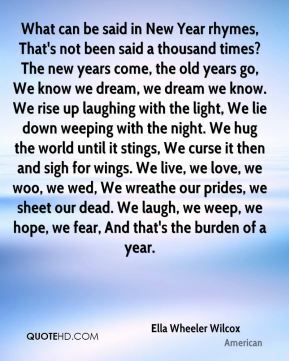 Then arise, O idle dreamer! Dreams are sweet, But better flowers are growing at your feet. 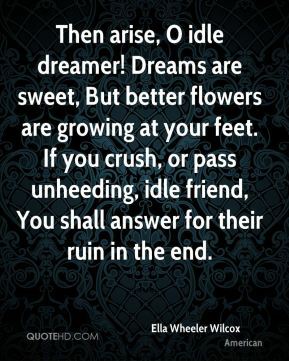 If you crush, or pass unheeding, idle friend, You shall answer for their ruin in the end. 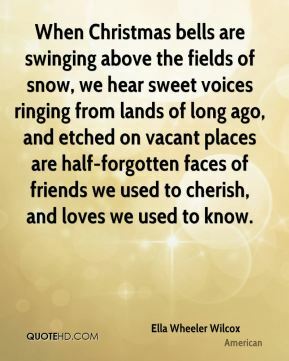 Far from the city's dust and heat, I get but sounds and odors sweet. 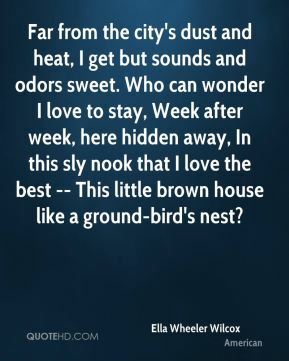 Who can wonder I love to stay, Week after week, here hidden away, In this sly nook that I love the best -- This little brown house like a ground-bird's nest? 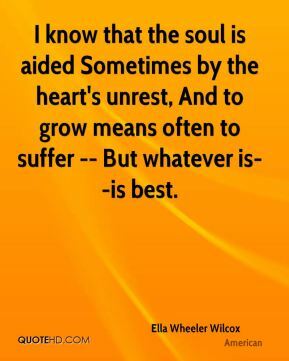 I know that the soul is aided Sometimes by the heart's unrest, And to grow means often to suffer -- But whatever is--is best. Do you wish the world were happy? 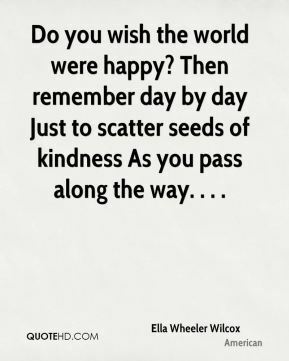 Then remember day by day Just to scatter seeds of kindness As you pass along the way. . . . 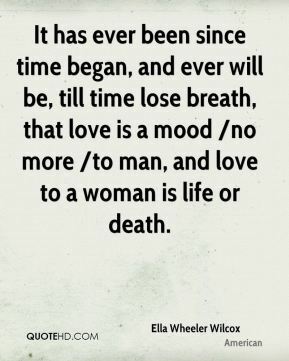 This is the way of it, sad earth over, The heart that breaks is the heart of the lover, And the other learns to forget. For what is the use of endless sorrow? 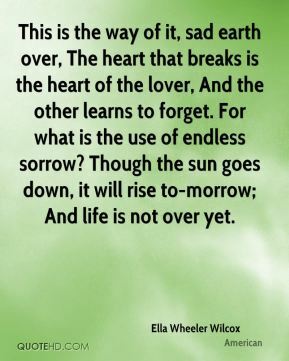 Though the sun goes down, it will rise to-morrow; And life is not over yet. 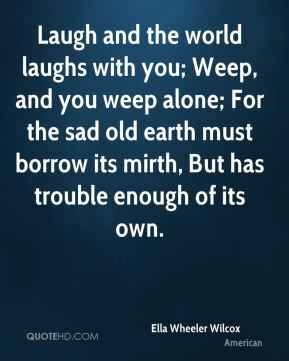 Laugh and the world laughs with you; Weep, and you weep alone; For the sad old earth must borrow its mirth, But has trouble enough of its own. 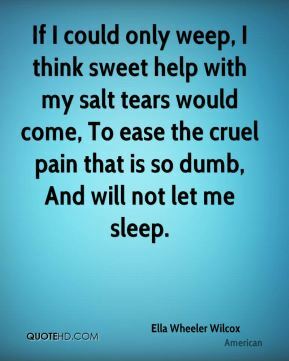 If I could only weep, I think sweet help with my salt tears would come, To ease the cruel pain that is so dumb, And will not let me sleep. 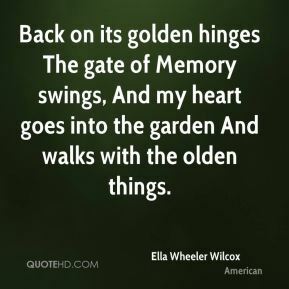 Back on its golden hinges The gate of Memory swings, And my heart goes into the garden And walks with the olden things. Love, that outreaches to the humblest things; Work that is glad, in what it does and brings; And faith that soars upon unwearied wings. Divine the Powers that on this trio wait. 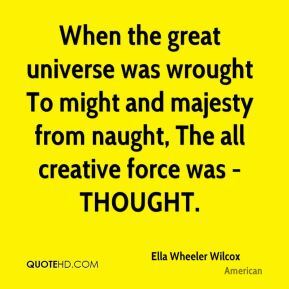 Supreme their conquest, over Time and Fate. Love, Work, and Faith -- these three alone are great. 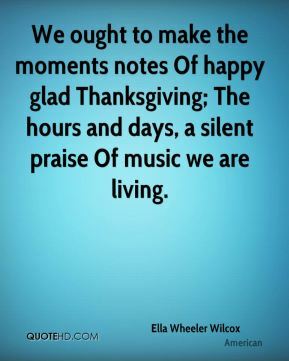 Waste no tears Upon the blotted record of lost years, But turn the leaf, and smile, oh! 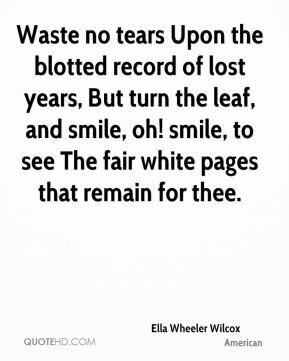 smile, to see The fair white pages that remain for thee. Oh! 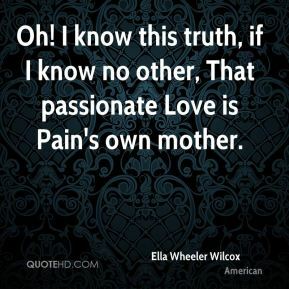 I know this truth, if I know no other, That passionate Love is Pain's own mother.